The bright young man approached the small brick house that he had inherited. “I do not like this building,” the man said, “but neither do I wish to sell it.” Firstly, the young man examined the cornerstone, which did so bear the name “Jesus Christ”. Then, he began to examine each brick that did make up the wall. The first brick bore the name of the first book within the Holy Scriptures, Genesis, and each other book in the first testament also had its name on a brick. These bricks were so joined together by a Hebrew word, which the young man did not recognize. There were also bricks that bore the names of the New Testament books: those books that the young man was more familiar with. They were so joined by a Greek word, but the man did not recognize the Greek word. He did not like that there were words that he could not recognize and, furthermore, that these unrecognizable words were the bricks upon which all of the books rested. Carefully, the bright young man took his pocketknife and began to carve out just these bricks, replacing them with the English words “old” and “new”. Soon, as he was replacing bricks, the man forgot the order of the bricks that were there. Some of the inscriptions on the previous were not on the new and other inscriptions were added that did not belong. The man finished the building and stepped back to look at his work. The bricks were new and clean and, from a distance, the house looked as though it was still the building of the original builder. As he got closer, he recognized the details that had been changed. As the young man lived in the house, he began to add on and to invite others to stay with him. The young man was pleased. The brother left and the young man dwelt upon his words. Perhaps this was another house that also belonged to the builder! After all, the young man had only restored it. 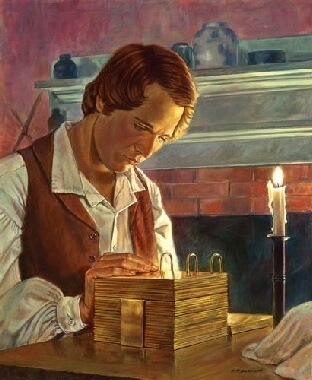 To the front of the house, the young man did place a sign that read, “The House of Mormon: another building of Jesus Christ.” “It grieves me that there now exists a society where all things are rebuilt and signs are posted,” said the brother upon his return to the true house of the builder. Let us carefully and prayerfully examine beliefs and practices before choosing to engage. This will be more important as society becomes even more relativistic. To those Mormons who read this, Jesus Christ truly does love you and truly does want a relationship with you, but there are true scriptures that cannot be replaced; true bricks that have been laid by the builder.